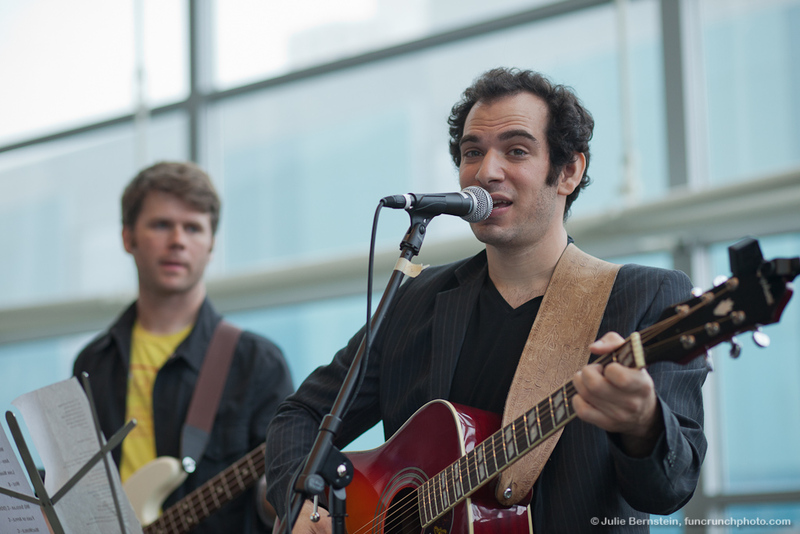 Three years ago at Macworld Expo I saw a performance by Jonathan Mann and the Rock Cookie Bottoms. I thought it was awesome, I took photos. I later found out that Jonathan had been posting a song online every day for over two years. And he was also a vegan, and lived in Berkeley. Awesome! I followed him on YouTube and friended him on Facebook, and attended several more of his shows, including a live performance of Song A Day #1000. Fast-forward to January 2014. Jonathan is now living in Brooklyn, but still going strong, with over five years of daily compositions to his credit. He decided to mix things up by doing a collaboration every day of the month. I found out about this too late to join in, or so I thought; he invited everyone, not just from the January collabs but everyone everywhere, to join in an epic collaboration for the final day of the month. And here is the result! A song featuring 45 musicians and dancers, of all ability levels, from all over the world. It was a great experience. I hope to have more chances to collaborate with Jonathan in the future.